Nene - Hakalau Forest NWR. 'I'iwi on native mint - Hakalau Forest NWR. Hakalau Forest National Wildlife Refuge is a protected area on the Big Island of Hawaiʻi. It is one of two units, along with the Kona Forest National Wildlife Refuge that is managed as part of the Big Island National Wildlife Refuge Complex. Access to the Kona Forest is restricted since it contains several endangered species. Hakalau Forest NWR contains some of the finest remaining stands of native montane wet forest in Hawaiʻi. The slopes below 4,000 ft (1,200 m) feet receive very high rainfall - 250 in (6,400 mm) annually. Bogs, fern patches, and scrubby forest dominate this area, which is dissected by numerous deep gulches. Rainfall decreases to about 150 in (3,800 mm) at elevations above 4,500 ft (1,400 m), where majestic koa (Acacia koa) and red-blossomed ʻōhiʻa lehua (Metrosideros polymorpha) trees form a closed-canopy forest. Further upslope, above 6,000 ft (1,800 m), rainfall decreases to 100 in (2,500 mm) or less and native forest merges into abandoned pastureland where alien grasses and weeds, introduced as forage for cattle, are the dominant vegetation. Since 1989, over 400,000 koa, ʻōhiʻa, and other native plants have been planted in this area as part of the refuge's reforestation program. The Pua Akala Cabin, located within the refuge, was nominated to the National Register of Historic Places in August 2008. In 1985, 32,733 acres (132.47 km2) on the eastern slope of Mauna Kea were established as the Hakalau Forest Unit. In 1997, the Fish and Wildlife Service purchased an additional 5,300 acres (21 km2) of land to create the Kona Forest Unit of Hakalau Forest NWR. The Kona Forest Unit includes lands within the Hoʻokena and Kalahiki land divisions on the western slopes of Mauna Loa, at elevations of 2,000–6,000 ft (610–1,830 m). One of the primary purposes for the creation of this unit was to protect the habitat of the ʻalalā (Corvus hawaiiensis), which is now extinct in the wild. 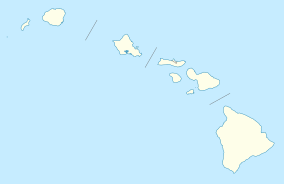 The Kona Forest Unit is located about 23 mi (37 km) south of Kailua-Kona, coordinates 19°22′58″N 155°51′5″W﻿ / ﻿19.38278°N 155.85139°W﻿ / 19.38278; -155.85139. The Kona Forest district is somewhat drier than the Hakalau Unit. Much of Hawaii’s native lowland habitat was degraded following the Polynesians’ arrival over a thousand years ago. In the late 18th century, cattle, goats, and European pigs were released into the forests, and hundreds of additional alien plants, animals, and insects have subsequently been introduced. Most lowland plants seen today like the orchid, ginger, and plumeria are aliens or nonnative. Introduced animals such as mosquitoes, wasps, small Asian mongooses, cats, and rats have also harmed Hawaiian habitat and native species. Grazing pressure by cattle and pigs has resulted in the replacement of Hawaiian plants by more competitive alien grasses and shrubs within the upper portions of Hakalau Forest. Below this pasture area, the native tree canopy is still intact, but the native understory has been replaced by alien grasses, blackberry (Rubus spp. ), banana poka (Passiflora tarminiana), and English holly (Ilex aquifolium). The replacement process may have been accelerated by efforts to create more pasture land through bulldozing and burning, and by logging mature trees for timber and fence posts. Eight of the 14 native bird species occurring at Hakalau are endangered. Thirteen migratory bird species and 20 introduced species, including eight game birds, as well as the endangered ʻopeʻapeʻa (Hawaiian hoary bat, Lasiurus cinereus semotus) also frequent the refuge. Twenty-nine rare plant species are known from the refuge and adjacent lands. Twelve are currently listed as endangered. Two endangered lobelias have fewer than five plants known to exist in the wild. Only the Upper Maulua Unit of Hakalau Forest National Wildlife is open to the public for wildlife-dependent activities such as hiking, bird watching and photography. All other units of the refuge are closed. Access to Upper Maulua is permitted on Saturdays, Sundays and holidays between sunrise and sunset. Every visitor to Upper Maulua is required to have a reservation. Reservations can be made by calling the Hakalau Forest NWR office at least one week prior to entry. ^ a b c d e f "Hakalau Forest National Wildlife Refuge". official web site of United States Fish and Wildlife Service. Retrieved September 6, 2010. ^ United States Fish & Wildlife Service (September 2008). "Protecting Habitat and History" (pdf). Retrieved September 6, 2010. ^ "Hakalau Forest National Wildlife Refuge". Wilderrnet.com web site. Retrieved 2009-07-23. Wikimedia Commons has media related to Hakalau Forest National Wildlife Refuge. This page was last edited on 19 November 2016, at 07:26 (UTC).